Late winter and early spring seem to just bring on colds in my household. This year it feels like they have hit early: a strain has gone around world and the childcare centre, then around and around again. Nothing better to soothe a cold than some homemade soup. A friend of mine came down with a cold. He has gone through a bit of a tough patch and is the sort of person who never really stops to recover properly, runs himself down, and puts other people first. (Can you relate?) I wanted to make him something that would help a speedy recovery. Normally I would make chicken soup but in this case it wasn’t suitable as he is vegetarian. Chicken soup has amazing healing properties, and is reputedly good for boosting the immune system and helping recover from colds. Can a vegetarian soup do the trick? Could it be robust enough? And would it be tasty? I did some research about the top ten foods that help fight a cold, and realised that most of them are suitable for vegetarians. Well, Western vegetarians at any rate: in Taiwan and elsewhere in Asia strict vegetarians avoid onion and garlic. And onion and garlic feature strongly in most lists of flu-fighting foods. This soup is actually not truly vegetarian in any case as it utilizes Japanese dashi stock powder, which is made from dried bonito fish. (My friend eats seafood so that is okay.) You can substitute a good quality vegetarian stock instead, or even better use miso paste – while this would make the soup more expensive, it has amazing health and immune boosting properties and is therefore arguably worth the investment to your health. 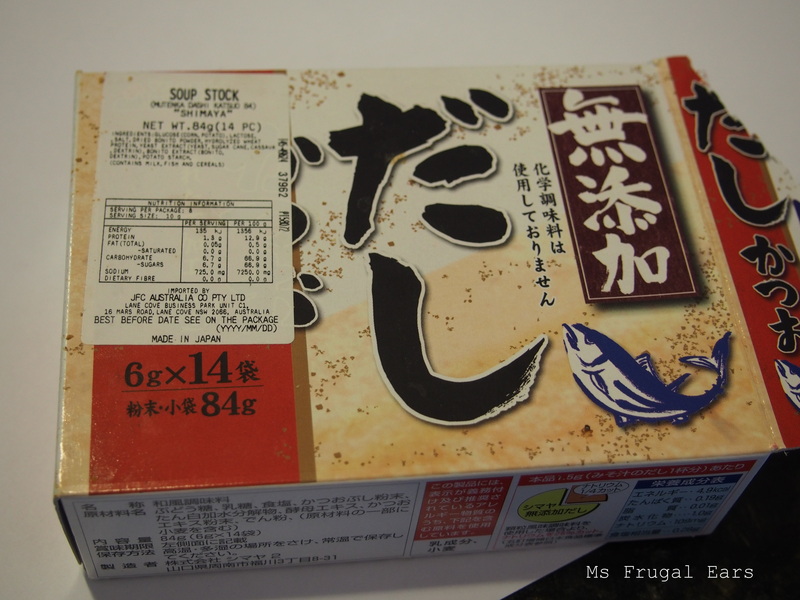 I have used instant dashi powder, but if your budget stretches try to get a better quality dashi as it is a much healthier and nutritious product. 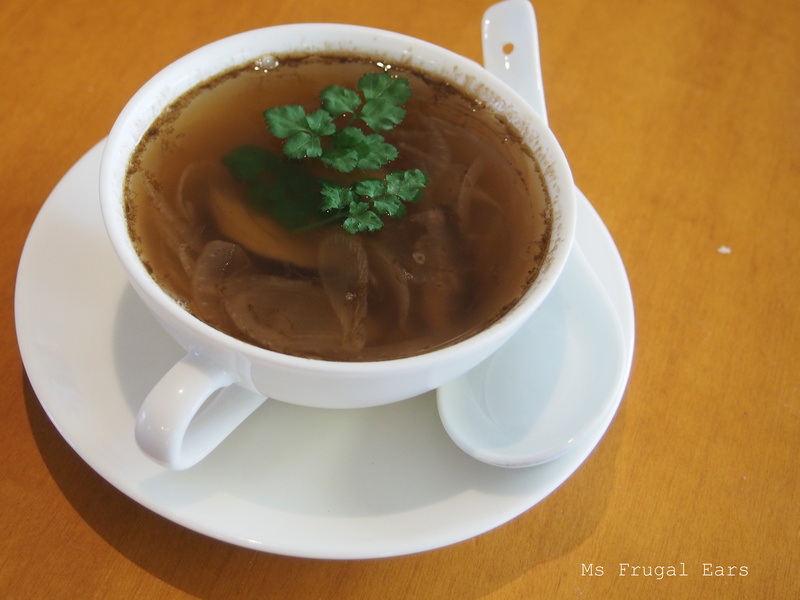 This recipe is inspired by the classic French Onion soup, but with an Asian twist. There are similarities in the heavy use of onion but it is not quite the same. Slice the onions finely. I used a mandolin, which was very effective in helping get consistent, thin shreds. 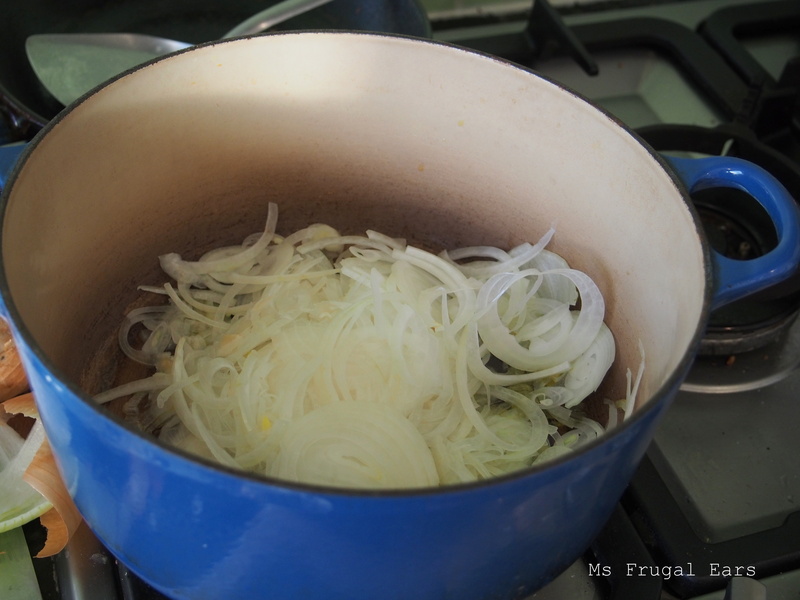 In a large saucepan, fry the onions slowly in the olive and sesame oils on a low heat. I fried mine for around 10 minutes, then sprinkled with sugar added ginger and fried for an additional 5 to 10 minutes. Unlike a French Onion Soup, I cooked the onions so that they were well done (translucent) but not quite caramalized. 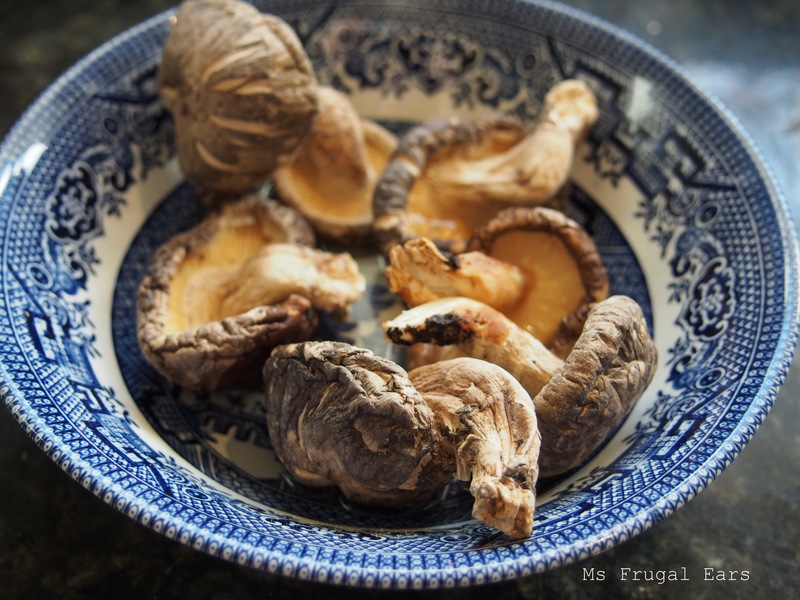 Meanwhile, rinse the shiitake mushrooms in water, then soak in a bowl of warm water for around 10 minutes or until softened. Slice thinly and reserve the water. Pour in two litres (or more) of water on top of the onion mixture, and add the leftover water that the shiitake mushrooms were soaked in. Add the dashi powder, soy sauce, rice wine and shiitake mushrooms. Bring the sauce to a bowl and cook for around 20 to 30 minutes. Serve hot in bowls with a drizzling of sesame oil, and if you have some cheaply and easily to hand, cilantro (which also has health benefits for fighting cold and flu). For a heartier meal, you could spoon over rice and add a poached or boiled egg. Winter is good weather for soup, isn’t it? Lovely to meet you, too. This looks wonderful! 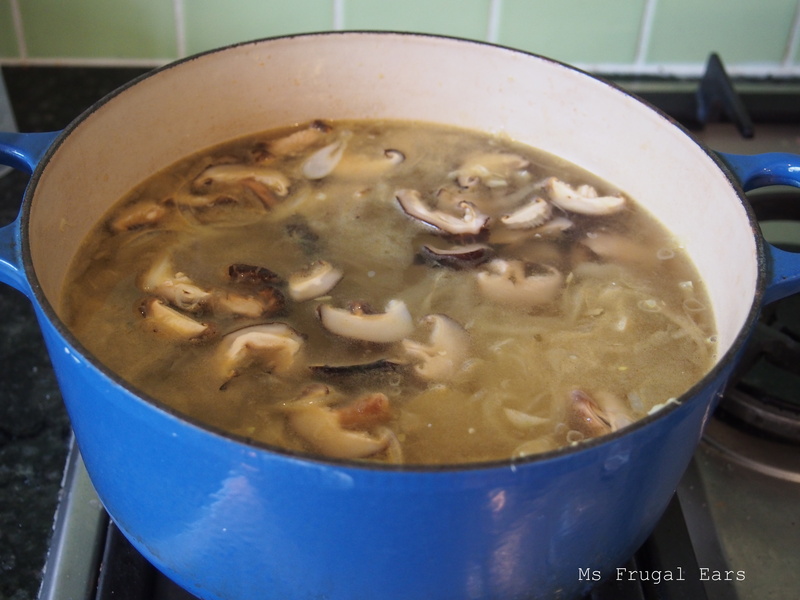 I have a thing for a good soup with mushrooms. You can’t beat the price for this either!